Poppaea Sabina (30–65AD) was named after her maternal grandfather C. Poppaeus Sabinus who was Consul in 9AD as was her mother. She was born probably in Pompeii based upon records discovered in the excavations. Poppaea became Nero’s second wife in 62AD. She had been previously married to Rufrius Crispinus, who was the Praetorian Prefect under the previous Emperor Claudius. Poppaea then married the future Emperor M. Salvius Otho. Nero sent Otho to Lusitania as governor, and his wife remained behind in Rome when she became Nero’s mistress. Nero took a fancy to her about 58AD and she then divorced Otho and married Nero becoming his second wife. Poppaea was said to be a beautiful woman who held power over Nero. The historian Tacitus, who biased against Nero, claims that Poppaea was the actual reason that Nero murdered his mother and his first wife Octavia who was the daughter of Claudius. 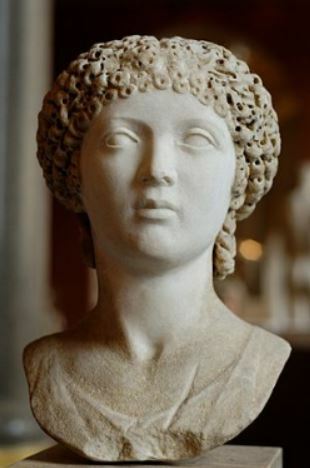 Nero’s mother opposed any divorce with Octavia. 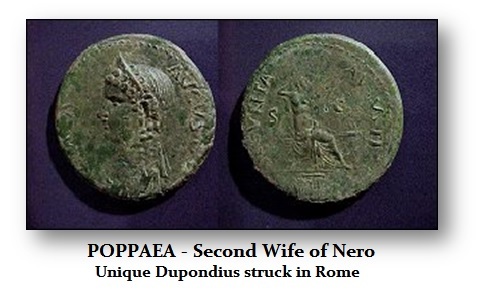 Poppaea is believed to have induced Nero to murder Agrippina Jr. in 59AD so that she could marry him. Nero finally engineered Agrippina’s death in 59AD by stabbing, after several unsuccessful attempts, including a staged shipwreck (she was a very good a swimmer). He then issued coins in her honor announcing she was now a god in the normal tradition. Some have questioned the veracity of this account since Nero did not marry Poppaea until 62AD. Furthermore, Suetonius records that Poppaea’s husband, Otho, was not sent away until after Agrippina’s death. This seems plausible for Nero could not marry her without a divorce. Other proposed that Nero’s decision to kill his mother was instigated by her plotting to set Gaius Rubellius Plautus (Nero’s maternal second cousin) on the throne when she was losing control of Nero rather than as a result of Poppaea’s motives. Tacitus who seems very biased against Nero claimed that Poppaea pressured Nero to divorce and later execute his first wife Octavia in order to marry her. Octavia was first sent to Campania, and then imprisoned on the island of Pandateria, where the royal family members were traditionally banished (today Ventotene), a commonplace of banishment for members of the imperial family under the charge of adultery. Nero divorced Octavia, claiming she was barren and married Poppaea 12 days after the divorce. Within the year, Octavia was murdered and her head was brought back to Rome so that Nero could show it to Poppaea as the story goes. On January 21, 63 AD she bore Nero a daughter whom they named Claudia. The child survived only four months and was briefly remembered on a few colonial coinage issues. By the summer of 65AD, Poppaea was pregnant again. Reportedly, Nero kicked her to death during one of his temper tantrums. The following year in 66AD, Nero’s took a third wife named Statilia Messalina who he married hoping for an heir. However, she did not please Nero and it was then reported that he reverted back to his homosexual lover Sporus, because it is said that he resembled Poppaea in appearance. 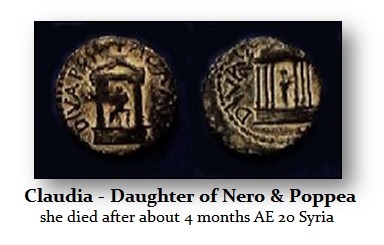 Nero did authorize coinage with Poppaea image to be struck in Rome. There is only one known example of a Dupondius known to exist (illustrated here) struck in Orichalcum (brass), the legendary metal of Atlantis. 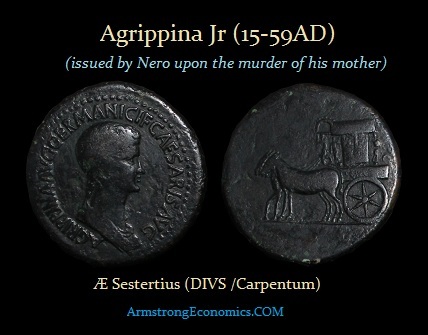 This is the only surviving coin in from Rome struck in Latin rather than colonial Greek struck in the provinces. No other Latin origin issues have been discovered. 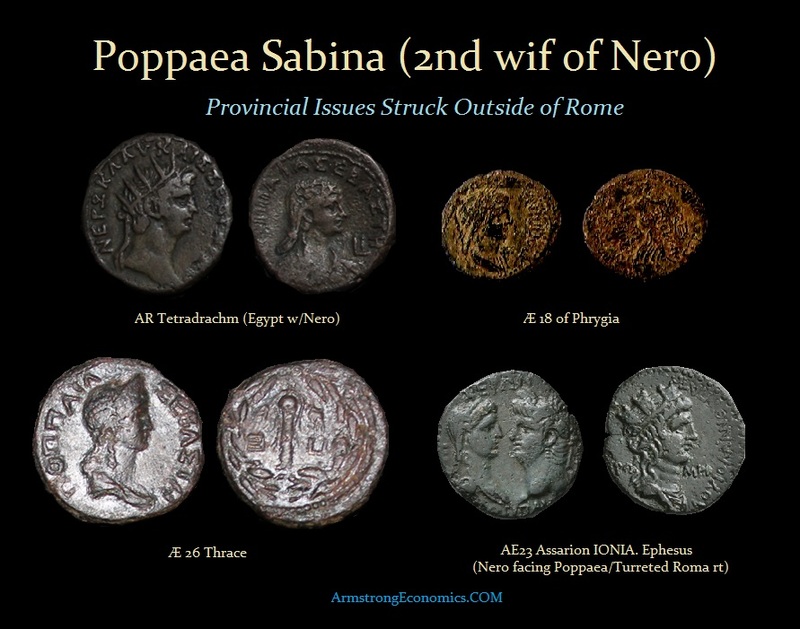 Given the fact that Nero deeply admired his beloved Poppaea, it is not surprising that at least some coinage was struck, perhaps even at her insistence. The design does not reflect her death, so it is presumed that this was struck before she died. The Latin issue of Poppaea may remain as one of the greatest rarities of the Julio-Claudian period. Provincial Mints: Perinthus(*), Nicaea, Thyatira, Magnesia-ad-Sipylum, Smyrna, Ephesus, Laodicea, Ancyra, Acmonea (*), Iconium, Galatia, Antioch, and Alexandria.